Sycamore fig (Ficus sycomorus. Moraceae) also called old world sycomore or just sycomore. Persian lime Also known as tahiti lime. 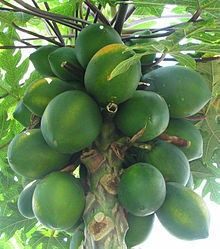 Tropical fruits grow on plants of all مسکن (بیئیات). The only characteristic that they share is an intolerance of frost. Canistel (Pouteria campechiana; Sapotaceae), also called yellow sapote or "eggfruit"
Woodapple (Aegle marmelos) ,commonly known as bael, found in eastern India. Mango (Mangifera) ,tropical fruit of south Asia. Canada and the United States are home to a surprising number of edible plants, especially berries; however, only three are commercially grown/known on a global scale (grapes, cranberries, and blueberries.) 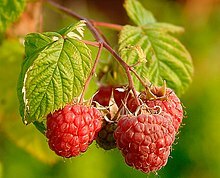 Many of the fruits below are still eaten locally as they have been for centuries and others are generating renewed interest by eco-friendly gardeners (less need for bug control) and chefs of the region alike. American persimmon (Diospyros virginiana; Ebenaceae): Traditional for desserts and as dried fruit. Black cherry (Prunus serotina; Rosaceae very popular flavoring for pies, jams, and sweets. Prickly pear (Opuntia spp. ; Cactaceae) used as both a fruit and vegetable depending on part of plant. Podocarps are conifers in the family Podocarpaceae. The seed cones are highly modified and, in some, the seed is surrounded by fleshy scale tissue, resembling a drupe. These berry-like cone scales are eaten by birds which then disperse the seeds in their droppings and the cones can be eaten in many species. Podocarps are either half-hardy or frost tender, depending on species. Many genera are similar in that they have edible "fruits" and often don't have a common name.